After 2 years without an issue, since 2 days ago my Loki has started freezing during the shutdown (as well as rebooting) process. 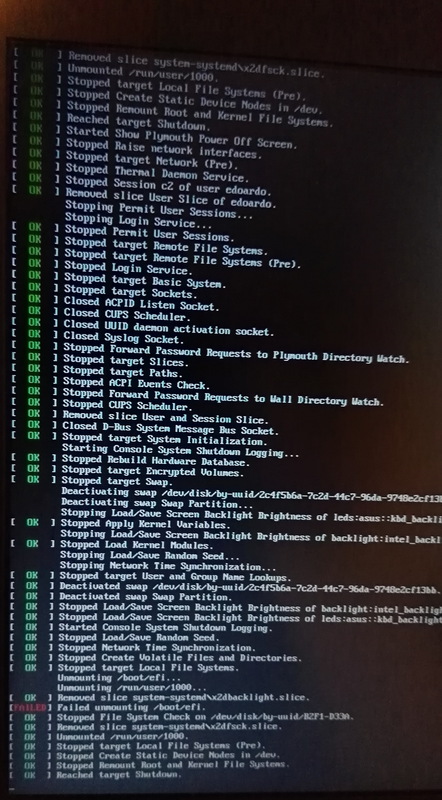 I have tried the most common solutions found on the internet (working on GRUB, booting into an earlier Kernel), but to no avail. When I shut down, it freezes on the shutdown image (elementary OS logo, at this point not "pulsating" any longer, just stuck, and the screeen won't turn off). Pressing ESC reveal what you can see in the picture below, fixed and unchanged. I will be very grateful to anyone trying to help with this! I could tell you to downgrade systemd right away, but you will be able to do it only to the first release not the last update. You'll miss a lot of fixes with it, check the changelog below for more details. , and then decide what to do. Not the answer you're looking for? Browse other questions tagged release-loki shutdown or ask your own question.